Competition: Win a copy of The Walking Dead Season 3 on DVD & a Walking Dead hoodie! 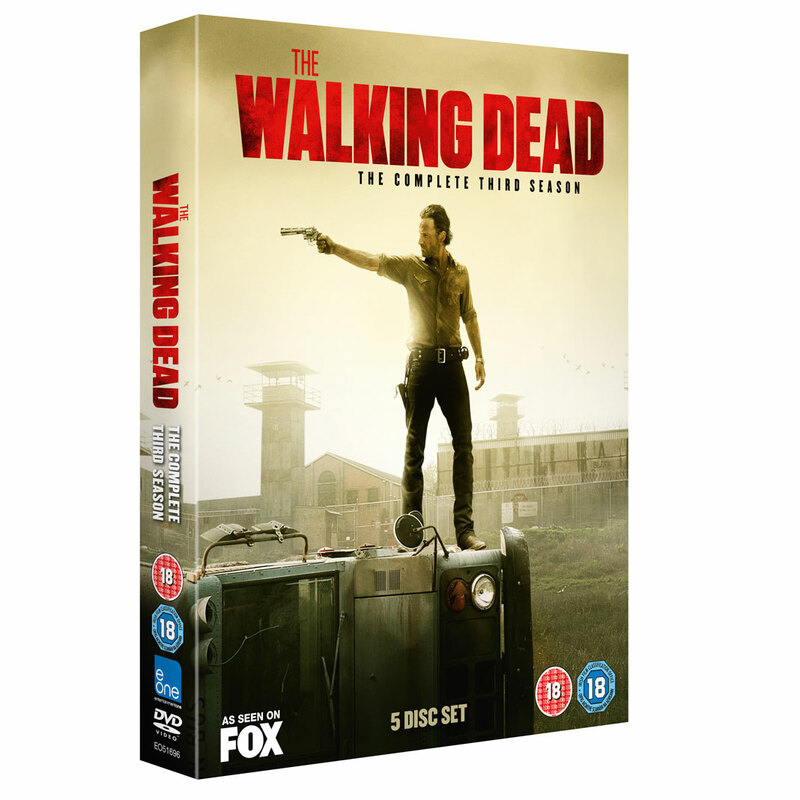 With The Walking Dead Season 4 due to hit our TV screens in October (14th Oct on Fox UK at 10pm), now is the perfect time to pick up a copy of The Walking Dead Season 3 on DVD or Blu-ray, which is release on the 30th September 2013 in the UK! Just check out the instructions below on how to win! How to win The Walking Dead Season 3 on DVD & a Walking Dead Hoodie! The competition closes on 26th Oct 2013 and is open to UK residents aged 18 or over. There will be 3 winners picked from entries on geektown.co.uk and Twitter. This would be an awesome win for my wife and I! We rarely seem to be home at the same time when the show airs on tv, so sadly we have both missed an episode or two! It would be nice to sit down and watch them all together! I want to win, people keep telling me it’s a great show – so it would be an incentive to start watching!!! Winning = living! You wouldn’t leave me out here to the walkers with out even a sweater would you?! At least throw me a dvd set to distract them with! come on guys! The Walking Dead is by far my favourite thing to watch on TV, but unfortunately I have missed some episodes due to barious reasons. I would be over the moon to win this, it would make me really happy to to able to sit down and watch it all properly, so to pick me would result in making someones day/week. You should pick me because I don’t think you will! Need hoody…and brains! Iit cold when you have no circulation. Need DVD to study living know their weaknesses – how is a Zombie to survive a zombie apocalypse otherwise? #zombieswerepeopletoo! Would love to win this for my husband who loves the show. I’m DESPERATE to win!!! Please please please please. Please?!?!?!?! would like to win as the walking dead is as I feel when I wake up. i love the walking dead, it was a long wait for the new season to start! I would love to win this for my brother, he’s a big fan! i didn’t watch not even one episode of The Walking Dead, so if I would win this I promise to get it from beginning and watch it ALL! id like to win because half the time I think I am a zombie. Obviously I want to win, otherwise I wouldn’t be here! But I think I deserve to win as my boyfriend’s a massive Walking Dead fan and he’s recently been made redundant, so needs a treat to cheer him up! because me, hubby and our friends are nutty about the show! And I simple need that hoody for when we need to enact our zombie survival plan! I really want to win, me and the fella adore this show!!! I want to win because me and the hubby love Walking Dead and have been watching it from the beginning! I desperately need the hoodie to hide the zombie bite in the back of my neck…. I’d like to win as I have a baby and I’m a walking mombie! I want to win because I love zombies. I would love to win because I am late to the party & am halfway through season 2 so winning season 3 would be perfect to carry on! My son says I need to have a hoodie to be cool like him…. however he would be ‘outcooled’ by a walking dead one! I want to win that mother fuffin hoodie so I can strut around like a badass! Right lets see I could put “I want to win!! !” nope thats been done, How about say “Im a massive walking dead fan!!!!”? no thats been done too. I suppose I could go on about being a fan of the horror genre or that i just love Zombies in general after all whats not to love about zombies they just remind me of my hubby after hes played Battlefield for several hours. No what I think I will say is I can make my Ears wiggle, surely thats got to be a winning comment? I want to win !!!!! I want to win! as I love the walking dead (even more than GOT – which is a lot) it pains me having to wait an entire week to see the next episodes so if i won this at least it would soften the blow ! I really really want to win. hi! i think i should win because despite her faults, i LOVED Andrea, and by owning season 3 its the last chance i get to see her in action! Please pick me and let my dreams live on! I need the walking dead, I am such a big fan! I don’t know who you are. I don’t know what you want. If you are looking for ransom, I can tell you I don’t have money. But what I do have are a very particular set of skills; skills I have acquired over a very long career. Skills that make me a nightmare for people like you. If you let my Hoodie & Walking Dead DVD go, that’ll be the end of it. I will not look for you, I will not pursue you. But if you don’t, I will look for you, I will find you, and I will kill you. I wanna win because I want that dang fine hoody! I would love to win … I wish I had a hard luck story but life is good but would be even better if I won. I want to win – Pick me because i would really really appreciate winning this and I would be ever so thankful – my fiance has had a bit of a hard time of late and he loves the walking dead and he little face would light up if I suprised him with this!! You should pick me to win cos Im a huge zombie fan, (i even have a zombie pinterest board lol http://www.pinterest.com/xxladyluck13xx/zombies/). Ive just volunteered to be a zombie in the Zombie Earth game in leicester, i wanna chase people and scare the living bejesus out of them, and im a Walking Dead fan, and if Daryl dies, i riot!!!! I would love to win The Walking Dead Season 3 on DVD because its my favourite TV series and I own the first 2 seasons so it will complete my collection. i would love to win a copy of season 3 of the walking dead as its a real family affair all my children have been bought up watching it.My son only wanted season 1-2 for his 11th birthday and watches the trailer for season 4 daily .In case of a walker invasion we are fully prepared and all children have the knowledge to destroy walkers ,but you can never be too prepared so we would love season 3 to have totally be prepared .Countdown for season 4 is 16 days and counting the uk cant wait !WE LOVE TWD !!!!!!!!!! I would love to win as The Walking Dead has been one of my favorite shows ever since it has been broadcasted!! My boyfriend dumped me out of the blue, having got me hooked on the walking dead. How fab would it be to go around to remove the final boxes from my (now his) house wearing a walking dead hoodie?! I would come back from the dead to see the new series! I need my zombie fix in between seasons…please save me!!!! I don’t know who you are. I don’t know what you want. If you are looking for ransom, I can tell you I don’t have money. But what I do have are a very particular set of skills; skills I have acquired over a very long career. Skills that make me a nightmare for people like you. If you let me win the DVD, that’ll be the end of it. I will not look for you, I will not pursue you. But if you don’t, I will look for you, I will find you, and I will eat you. I would LOVE to win this for my Walking Dead obsessed hubby!!! It’s his birthday on the same day it returns to our screens in October and this would be the PERFECT present for him! I have EVERYTHING crossed!! Please pick meeeeeeeeeeeeeee! I want to win! Love the show, and I want that hoody, my daughter will love it, but I won’t let her borrow it! I love the Walking Dead ,great series! I’d love to WIN !!! The Walking Dead – that sounds like chucking out time at my local pub. I need to win this, the zombies are coming and as yet I’m not sure I know the best way to survive. This instructional boxset will be most helpful. Of course if they end up being running zombies then we’re all stuffed! Me me me me! I love the walking dead! And you know, hoodies will be useful when it happens for real – keeping warm, and incognito. You’ll be helping me prep! Would love to win the DVD and the hoodie! Send me a prize or I’ll be round to eat your brains. Big fan of the series. i want to win so i can watch the episodes in preparation for a zombie apocalypse! Yes please me to win! Let me win so i can watch all the episodes when Breaking Bad comes to an end. I’m an actual zombie so you best let me win or else your brains are on the menu! What a brilliant prize! I am a fan of all things Zombie and wearing the hoodie, I would be everyone’s envy! I would like to win this amazing prize ! The hoodie will definitely suit me if I wear it in the morning when I get up!! Because its the best thing on TV for ages and Zombies rule! I want to win, cause my boyfriend has really got me into the walking dead and we have all seasons so far (1&2) but not 3 … and when I watch it with him its soo cold in his house so can make him jealous by wearing the hoody too ha! BTW you can’t retweet that message as you haven’t tweeted the original! Great comp! Would love a win!!! Awesome competition! I would love to win because I am addicted to zombies. Seriously, I’m pretty sure there must be some medical term for addiction to zombies, maybe walking dead syndrome? Family seem to think I have zombie issues but regardless that’s between me and my future therapist I am sure. Where was I? Ah yes, back to the topic, I love zombies, and I love hoodies, so this is a match made in heaven! I want to win as I’ve killed zombies in a disused shopping mall and therefore can relate to the character. Actually it’s The Walking Freakin Dead why wouldn’t I want to win?! !